Come along on a 7-day excursion that takes you through the highlights of this South East Asian gem called Myanmar, that is bordered by Bangladesh, India, China, Laos, and Thailand. You will visit the lovely Garden of Yangon, where the city center still houses many impressive old buildings from the British Colonial period. 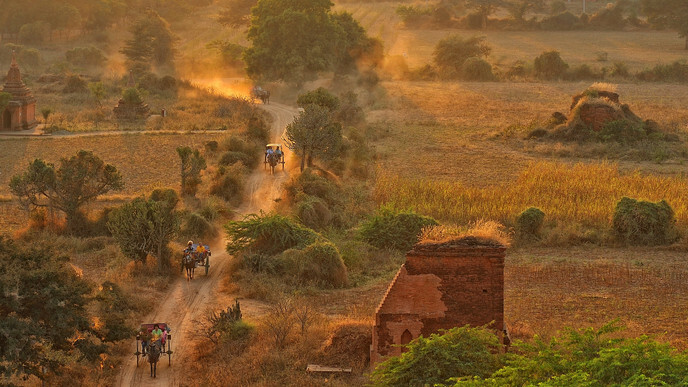 Encounter the country’s long tradition of historic kingdoms, Buddhist temples, and stupas at the Ancient City of Bagan. This trip provides plenty of opportunities to experience the fascinating Burmese culture with ease. Your last stop, Mandalay, is the cultural and religious center of Myanmar. Departing from Mandalay is seamless for visiting, you'll have maximum time to enjoy all the culture and history this beautiful country has to offer! The first day of your trip begins as soon as you arrive at Yangon International Airport! 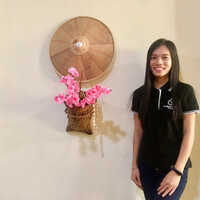 You will be welcomed by our friendly, experienced English speaking guide and then escorted to your comfortable hotel in Yangon City. You can spend the rest of the day as you wish, relax at your hotel for the remainder of the night or get acquainted with the city! After a delicious breakfast at your hotel, you'll spend the day exploring Yangon. Yangon is the former capital of Myanmar and compared to other Asian cities of similar size, it's impressive with beautiful scenery, above which shimmering pagodas seem to float! You'll begin your excursion with a visit to Sule Pagoda, located in the very center of Yangon and witness the tall golden Zedi. Next, you will travel to Kandawgyi Lake, which has spectacular photo opportunities of Karaweik Barge, the lake, and the Shwedagon Pagoda. You'll also visit the sprawling 70-year-old, Scott Market that has the largest selection of Burmese handicrafts all under one roof! Next, you will proceed to Chaukhtatgyi Reclining Buddha, only a short distance from your final destination of the day, Shwedagon Pagoda. Here you can watch the 2,600-year-old gilded Pagoda under the evening sky. After breakfast, is a transfer to the airport for your flight to Bagan. Upon arrival, embark on a sightseeing tour of Bagan, a deserted ancient city on the Irrawaddy River and home to over 2,000 temples and pagodas. Begin your journey with a visit to colorful Nyaung U Market, where locals come to buy and sell fresh produce and other goods. Visit the Shwezigone, the most famous pagoda in Bagan, this stupa is a graceful bell shape which became the prototype for Myanmar’s pagodas. Visit other significant landmarks such as Kyanzittha Umin with unique wall paintings of the 13th Century of Mongolia, Gu-Byauk-Gyi Temple, Htilo-Minlo Temple, and Thatbyinnyu Temple. After lunch, you can relax at your hotel before visiting Dhammayangyi Pahto, Sulamuni Pahto, and a traditional lacquer-ware workshop. Later, enjoy a serene sunset at Pyatthatgyi Paya or on top one of Bagan’s Temples. After breakfast, it's time for further sightseeing of Bagan! Drive to Mount Popa, the flower mountain. Mount Popa is home to the most powerful Nats (sacred spirits) and offers a beautiful view across the plains of upper Myanmar. 777 steep stairs (optional climb!) lead up to highest peak of its extinct volcanic vent with pagodas and small temples perched at the summit. After sightseeing around Popa, you will head back to Bagan. En route, you will visit Shwe Hlaing Village, a rural village that makes its living by producing various items from the toddy palm trees. Tour the village by foot and observe how to make Myanmar’s Candy and liquor at Toddy Climber’s Hut. 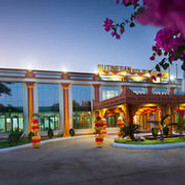 Finally, return to your Bagan hotel for a well-earned overnight stay. Optional Activity: Ballooning Over Bagan – A truly unique and unforgettable experience! See the beauty and diversity of the temples and stupas during sunrise! After breakfast, you will transfer to the airport for your flight to Mandalay. 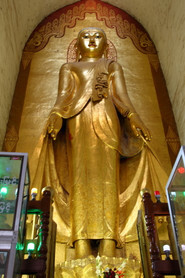 Upon arrival, you will first visit Mahamuni Pagoda, one of the most revered Buddha Images in Myanmar - this four-meter high image cast in bronze has been covered with a thick layer of gold leafs for many years. Next, you'll explore the traditional crafts workshops such as marble and wood carving, tapestry embroidery, and gold leaf making. Proceed to Shwe Nan Daw Kyaung, or “Golden Palace Monastery”, a memorial of the old Mandalay Fort, decorated with wood carvings and gilded interior walls detailing past-life stories of Buddha. Onward to Kuthodaw Pagoda, which is surrounded by 729 marble slabs inscribed with the entire Tripitaka, earning the nickname "the world's biggest book". To end the day, spend a few hours at Mandalay Hill enjoying the panoramic view in the final hours of sunset. After breakfast, you'll begin a full day excursion in the three ancient capitals! First, Mahagandayon Monastery in Amarapura, where you'll witness hundreds of monks attending their daily meal, as well, a visit to a silk weaving workshop. Next will be Ava, the capital from the 14th-18th centuries, we'll take a short ferry ride across the river to a horse and carriage to explore the wooden Bagaya Monastery and cross the bridge over the Irrawaddy River. Next is Sagaing, a city covered with 600 white-painted pagodas and monasteries. This religious center is home to 3,000 Monks and 100 meditation centers, which form the hilly landscape. We'll also visit Soon U Ponya Shin Pagoda, Umin Thonezeh Pagoda and Kaung Hmu Daw Pagoda. Finally, we'll drive back to Amarapura to enjoy the sunset over U Bein Bridge, the longest teakwood bridge in the world, then return back to your hotel in Mandalay. This marks the final day of the tour, however, you will still have a bit of time in the morning to explore the cultural city of Myanmar on your own! Visit the Mandalay Palace, Mahamuni Pagoda, grab a bowl of traditional 'Mohinga', or take a morning bike tour. Later, it will be time to say သွားတော့မယ် (goodbye!). You will be transferred to the airport for your departure flight to home or to continue your travels.